CAUTION: Strip planked projects can warp to the point of being unusable if one side of the wood core is fiberglassed and the other side is left unsealed. Changes in wood moisture content on the unsealed side will cause the project to change shape. 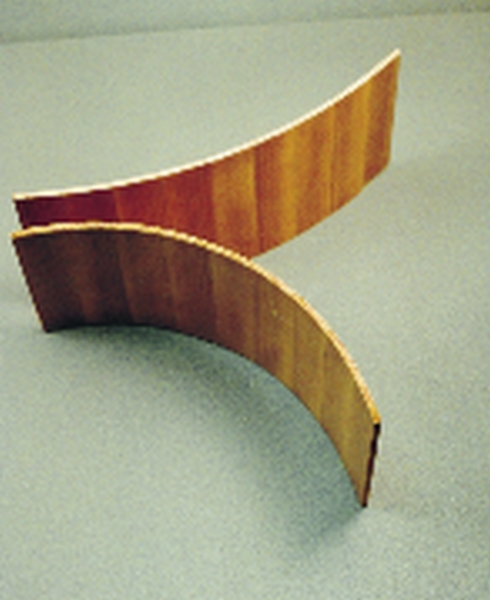 The potential for warping is greatest on thin wood-strip projects like canoes and kayaks. The thinner the planking, the greater the risk. This happened to me while building my first stripper canoe. I decided to take a break from the project after fiberglassing the outside of the hull. Two months went by before I pulled the canoe off of the mold. The bottom had inverted slightly because the unsealed side inside of the hull had taken up moisture and expanded. I caught the problem early enough and was able to correct it. I put the canoe back on the mold, dried the unsealed wood side with electric space heaters and quickly fiberglassed the inside before further change could take place. A friend of mine was not so lucky. Over a period of a year, his rowing shell tuned inside out like a dried out pea pod. He was not able to salvage his project. This photo demonstrates problem caused by a change in wood moisture content during the building process. Both panels were cut from the same strip planked laminate. The western red cedar laminate had a moisture content of 8% to 10% when fiberglassed on one (top) side only. The panel was perfectly flat at the time it was cut into two pieces. One piece was exposed to a very dry environment, the other a damp/moist environment for less than a week. You can see the potential for problems if one side is left unsealed. You can greatly reduce the potential for warping by working in a moisture controlled shop, using wood that has stabilized at 6% to 12% moisture content, and fiberglassing the inside shortly after fiberglassing the outside.